When NASA's Aqua satellite passed over tropical cyclone Lane on Aug. 27 it had just regained tropical storm status and showed powerful thunderstorms around east of its center of circulation. However, wind shear kicked back up and by 11 p.m. EDT that day, Lane had again weakened back to tropical depression status. NASA's Aqua satellite passed over Lane on Aug. 27 at 8:17 a.m. EDT (1217 UTC). The Atmospheric Infrared Sounder or AIRS instrument analyzed the storm in infrared light which provides temperature information. Temperature is important when trying to understand how strong storms can be. The higher the cloud tops, the colder and the stronger they are. AIRS saw coldest cloud top temperatures being pushed east of center by strong vertical wind shear. Those cloud top temperatures were as cold as minus 63 degrees Fahrenheit (minus 53 degrees Celsius). Storms with cloud top temperatures that cold have the capability to produce heavy rainfall. On Aug. 28, NOAA's Central Pacific Hurricane Center or CPHC noted that there were no coastal watches or warnings in effect. However, CPHC cautioned that interests in the Northwestern Hawaiian Islands should continue to monitor the progress of Lane. 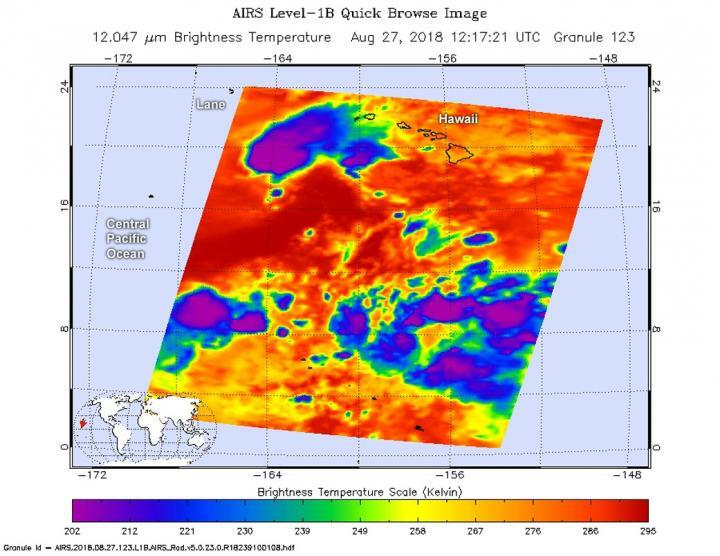 Infrared data on Aug. 28 showed only small, scattered and short-lived puffs of deep convection in the northern semicircle. CPHC said those were located from 50 nautical miles northwest to over 100 nautical miles northeast and east of the center. The University of Wisconsin- Cooperative Institute for Meteorological Satellite Studies or UW-CIMSS diagnosed vertical wind shear of over 69 mph (60 knots/111 kph) were affecting Tropical Depression Lane. Those winds are ripping away the cloud tops of strong storms near the low-level center and pushing them to the northeast. At 5 a.m. EDT (0900 UTC) on Aug. 28 (11 p.m. HST, Aug. 27) the center of Tropical Depression Lane was located near latitude 18.4 degrees north and longitude 167.4 degrees west. The depression is moving toward the west near 7 mph (11 kph). Lane is forecast to move to the north-northwest. Maximum sustained winds were near 35 mph (55 kph) with higher gusts. Slight weakening is forecast during the next 48 hours. Lane is forecast to become a remnant low pressure area later in the day. The remnant low is then expected to dissipate on Wednesday, Aug. 29 as it becomes absorbed into a developing extratropical low farther to the north.